Additional garnish - sliced green onion, chopped cilantro, chopped olives, etc. Place cream cheese in a microwave safe bowl and heat in the microwave for 30-40 seconds to soften slightly. Beat cream cheese, spices and sour cream together until smooth. Spread cream cheese mixture in the bottom of a 9 inch springform pan (or a pie plate if you'd prefer). Pour salsa verde over the cream cheese layer. 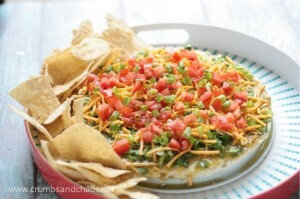 Layer on shredded lettuce, cheese, tomato and garnish with green onion, cilantro or olives. Remove outer ring from springform pan and place on a platter before serving. Serve with tortilla chips. You can make this ahead of time, cover with plastic wrap and refrigerate until serving.